Regal Entertainment Group has announced today their Ultimate Ticket promotion for the upcoming Wonder Woman movie. Starting today, fans can purchase their Ultimate Ticket for Wonder Woman, which allows them to see Wonder Woman once per day, for every day of the theatrical release. Here's what Regal had to say about this Ultimate Ticket, which will cost $100. "This one-of-a-kind collectible ticket features Wonder Woman's world famous double W logo laser cut and etched into textured anodized steel. Each card is personalized with the cardholders ship to name inscribed permanently on the back. Guests with the Regal Wonder Woman Ultimate Ticket receive ONE ticket to ONE showtime on each business day during the initial release of Wonder Woman at Regal theatres. Accepted for all film formats, including RPX and IMAX. No other film title will be substituted for any reason. Available exclusively at CorporateBoxOffice.com." For members of the Regal Crown Club, you can earn 10,000 credits with each Ultimate Ticket purchase, but not everyone will be able to buy one of these limited edition cards. Regal is only selling 1,000 of these Ultimate Tickets, so if you want to see Wonder Woman in theaters every day this summer, then you better act fast. You can purchase these tickets by clicking the link above, and fans should allow between three to four weeks for shipping. Earlier this month, box office analysts predicted that Wonder Woman could pull in upwards of $80 million during its box office opening weekend. While that figure is still a far cry from the $166.1 million debut of Batman v Superman: Dawn of Justice or the $133.6 million opening weekend of Suicide Squad, both of those movies suffered drastic drops in their second weekends, and it's possible that Wonder Woman may have more longevity. Both Batman v Superman and Suicide Squad were trashed by the critics, though, but many critics found Gal Gadot's portrayal of Wonder Woman as one of the highlights of BvS, so we'll have to see how critics respond to this stand alone Wonder Woman movie. We also reported earlier this month that Warner Bros. isn't planning a Wonder Woman sequel, but that may change if the movie overperforms at the box office. 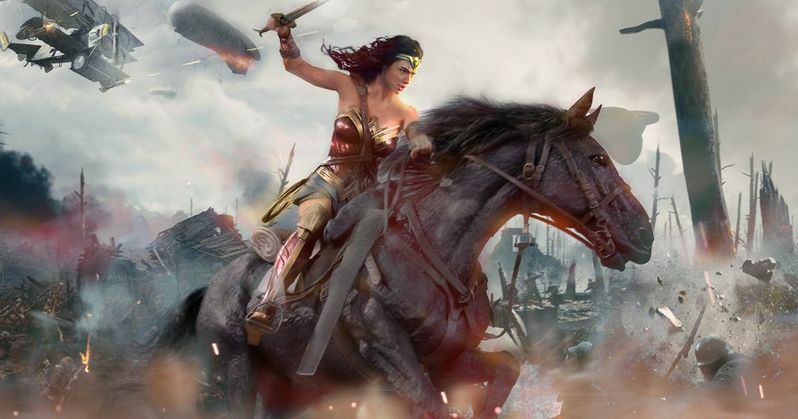 Before she was Wonder Woman, she was Diana, princess of the Amazons, trained to be an unconquerable warrior. Raised on a sheltered island paradise, when an American pilot crashes on their shores and tells of a massive conflict raging in the outside world, Diana leaves her home, convinced she can stop the threat. Fighting alongside man in a war to end all wars, Diana will discover her full powers...and her true destiny. The supporting cast includes Chris Pine, Robin Wright, Danny Huston, Ewen Bremner, Saïd Taghmaoui, Elena Anaya, Connie Nielsen and Lucy Davis. Take a look at this promo ad for the Wonder Woman Ultimate Ticket at Regal Theaters.